After being arrested for cutting the heads off parking meters, Korean War veteran Luke Jackson is sentenced to two years in prison. Luke winds up serving time in a Florida chain gang prison run by a strict warden. What seperates Luke from his inmates is his undying persistance. After gaining the respect of his fellow inmates Luke wins a game of poker by bluffing on a worthless hand of cards. 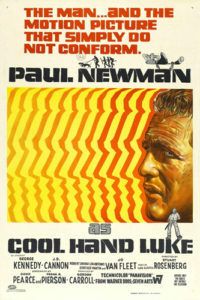 Proving that “sometimes nothing can be a real cool hand,” Luke quickly gains the nickname Cool Hand Luke. The film shows Paul Newman at his best as the slick inmate Luke. Luke’s arrival in the chain gang makes life a little bit more interesting for everyone invloved. Never giving in to authority, Luke continuously plans his escape from the prison. No matter how often he succeeds, and no matter how often the guards recapture him, Luke’s new escape plan in already in the works. “Cool Hand Luke” (1967) is a true classic and combinatines a good sense of humor with a strong prison break-drama. Cool Hand Luke proves to be one of few man that simply can’t be caught.